Xiaomi is back with another reminder that it doesn’t just make phones. (Despite dethroning Samsung as the top selling smartphone company in China.) Xiaomi’s latest device is a GoPro-like camera which, as we’ve come to expect, is selling for a fraction of its U.S. rival’s price. A GoPro Hero, the company’s entry-level camera, retails for around $130, but Xiaomi’s ‘Yi Action Camera’ is available for 399 CNY, that’s around $64. Standard caveat here: the device is limited to China, initially at least, where it can be bought via its Mi.com store using Xiaomi’s (usual) flash sale model. The device is being sold by Xiaomi, but it is from partner company Xiaoyi. Yi Action Camera (that’s the official English name for the product, Xiaomi told TechCrunch) records video at 1080p (60 frames per second) and includes a 16-megapixel camera that uses Sony’s highly rated Exmor R BSI CMOS image sensor. That’s superior on paper to the Hero, which records at 1080p30 or 720p60 and includes a five-megapixel camera. Xiaomi also beats the Hero on memory (its 64 GB allocation is twice as large), and weight (it is 72g compared to 111g), while it has a slightly larger battery. Like the Hero, the Yi Action Camera can go as far as 40 meters underwater, which is probably the most important stat for those of us who like to take a camera near water. One notable absence is the lack of rigging or casing for the camera — unlike GoPros, which ship with some basic accessories. 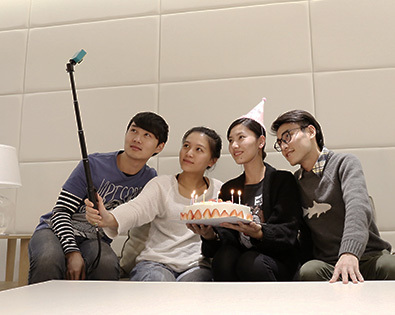 An $80 ‘travel edition’ of the Yi Action Camera does include a selfie stick mount, especially for those into taking photos of themselves. Beyond that, it appears that the device can be strapped to anything — even a cat?! — but some kind of protective case would be useful, we think. Xiaomi’s other products — which include an air purifier, and blood test device — can be remotely controlled via apps, and that’s also the case for the Yi Action Camera. Don’t hold your breath on the prospect of seeing this product surface outside of China — that’s a common refrain for Xiaomi products, but particularly true in this case. Xiaomi’s rationale for making an action camera isn’t necessarily to ‘clone’ GoPro — in the same way that it doesn’t clone Apple — it’s because it is essentially an internet-of-things company, as Stratechery writer Ben Thompson recently noted. Beyond just developing quality smartphones at strikingly affordable prices, Xiaomi is developing a network of hardware which also connects with its software, its MIUI version of Android, and its dedicated services, such as an iMessage variant and e-commerce store. If Xiaomi can provide all of your hardware needs, for instance, then clearly its software and services will play an important part in your daily life. Hardware companies make their money from selling devices, but with tight margins and a growing ecosystem of hardware partners, Xiaomi does things differently. International VP Hugo Barra recently told TechCrunch about some strategies that keep its prices so low, but the company’s larger goal is also to monetize via those services so keeping device pricing competitive is essential to getting people into its ecosystem. Once you own a Xiaomi smartphone, for example, you’re compelled to buy other Xiaomi devices, and thus its ecosystem has value — both to the user and to Xiaomi from a money-making point of view.